Article "Chinese Student Contrasts UR With University of Shanghai"
This article published in The Collegian features an interview with Chinese international student, Richard Lin Yang. 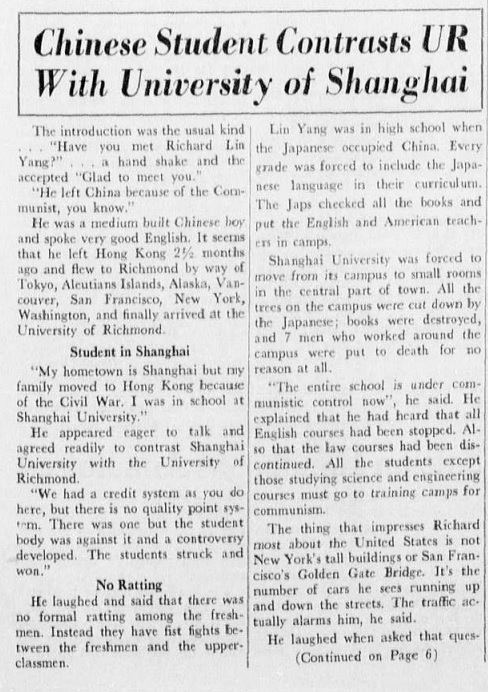 Yang tells the Collegian that he was originally from Shanghai, but moved to Hong Kong due to the Chinese Civil War (1927-1950) -- between the Kuomintang and Communist Party of China -- during the time. He answers a few questions regarding the differences between the University of Richmond and the University of Shanghai. He then describes how he was in high school when the Japanese invaded China and how now the country was under Communist control. The Collegian uses the term "Jap," a slur used to refer to the Japanese. 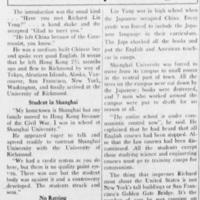 “Article "Chinese Student Contrasts UR With University of Shanghai",” Race & Racism at the University of Richmond, accessed April 18, 2019, https://memory.richmond.edu/items/show/1832.